Change is inevitable – the plans we’ve made for our lives, our careers, our relationships, our family, and our finances can suddenly need dramatic adjustment, and that is when we anxiously realise, often too late, that we need a Plan B. Whether it’s the immediate shock of suddenly being made redundant and asked to clear your desk, or the more fundamental challenge of changing your career or ending your marriage, how you handle change may determine how happy you are in life. WHO DO YOU WANT TO BE? 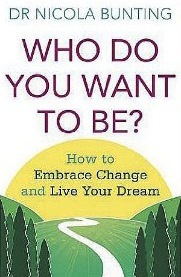 intends to be an eminently practical book, a vital resource to turn to when faced with any kind of major change in your life – how to identify the nature of the change you are confronting, how to prepare yourself for it, how and when and in what spirit to take advantage of the concurrent opportunities that present themselves. . .
An indepth coaching book from personal and professional coach, Nicola Bunting. WHO DO YOU WANT TO BE will take you through a real and long lasting transition from being stuck in a rut/needing or having to change/coping with a crisis, to living a fulfilled life.